Tyson Kafentzis will be moving from linebacker to safety for Hawaii. Hawaii junior Tyson Kafentzis is eager to continue the family tradition of hard hitting from the safety position. His father, four uncles and a brother preceded him in the UH secondary. "I've always wanted to be back deep, see everything and come up and kill guys," said Kafentzis, who was in on 23 tackles as an outside linebacker last year despite missing four games with a sprained ankle. "I just imagine what it would be like to hit a guy from 10 yards away instead of five yards away. Big difference." Away from the field, Kafentzis is a thoughtful sort and a strong student in UH's travel industry management program. "Football is just one aspect of my life," he said. Kafentzis is the subject of today's weekly feature on Warriors players preparing for the upcoming season by UH football beat writer Dave Reardon. Sometimes when Rich Miano looks at Tyson Kafentzis he sees his own past. He sees his old college teammates, Tyson's uncles. 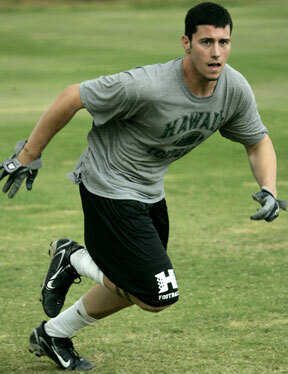 Or the player who preceded him as a star in the Hawaii secondary a quarter century ago: Tyson's father, Mark. "They're all similar in terms of aggressive style of play. They all have good speed and strength. ... His mannerisms, the way he jokes around, his facial expressions," Miano said of Tyson's resemblance to the five men of the previous generation who share his surname, bloodline and pride in wearing the UH uniform. Now the son will play the same position his father did, wearing the same number -- 8 -- which was also shared by uncles and his brother. Tyson is shifting to safety. Mark Kafentzis -- who went from UH to the Cleveland Browns in 1982 -- was a mentor at the position to Miano before heading to the pros. "He took me under his wing," Miano said. "He taught me everything from weight training to footwork drills to the playbook." It helped Miano get started toward all-conference status and a pro career of his own. Now, in his role as Warriors defensive backs coach, Miano will teach the craft to Tyson when fall camp starts next month. "I've known him probably since birth," Tyson said of Miano. "He kind of reminds me of my dad and uncles in his mentality." Tyson Kafentzis, who started at outside linebacker last year as a sophomore, is among several viable candidates to play alongside returning starting safety Jake Patek this fall. He said his long history with Miano won't mean he gets any breaks in what promises to be one of fall camp's toughest battles for a position. "Uncle Rich" who hiked St. Louis Heights with him when he was a little boy is now "Coach Miano" who is looking for the best player to fill a position. "He's going to be hardest on me, expect more from me. I don't think I'll be getting any special treatment," said Kafentzis, whose brother, Landon, also played safety for UH and Miano in 2004 and 2005 -- sometimes as a starter, sometimes as a backup. TYSON'S EXPECTATIONS for himself are high, but he said there is no added pressure because so many players with his surname have excelled at UH before him. "No, not at all. It's just football, it's not life and death," he said after a workout last week. "I'm not over there in Iraq. That's pressure. "Football's a game. I love the game, and anything I do, football, school, I'm going to do my best. But it is a game. My family would be proud of me regardless, even if I never played football. And that's how it should be." Mark Kafentzis said he is proud that his son combines passion for the game with perspective. "Tyson's a deep thinker," he said. "For his age he's a lot more mature than most kids. I always told him it didn't matter if he played football or not, he's still my kid. He's probably his own harshest critic. No matter how good he plays, he never had a good enough game." Returning starting safety Jake Patek, right, is helping Tyson Kafentzis as he makes the transition from linebacker to safety this offseason for the Hawaii football team. TYSON KAFENTZIS said he thinks he's a natural fit for the last line of defense. "My body is a safety's body. I'm pretty much a linebacker's mentality in a safety's body," said Kafentzis, who is now 6-foot-1 and 210 pounds. "I came in (from high school) at 198 and I should've played safety, but I played linebacker and that worked out well for me. But I didn't really feel comfortable weighing 230, 235, so I wanted to get back down, lose some weight and play safety." Miano said Kafentzis is bigger than his father was and not as fast, but that he is fast enough to play safety. Kafentzis said his focus this summer is acclimating to pass defense. "The biggest thing is not the mental part, but the physical part," he said. "I've got to get used to running, dropping and seeing the different routes and stuff. So seven-on-sevens are going to be crucial. I actually like it better, because you're at the very back and you see what everyone's doing." In high school in Richland, Wash., he played running back, tight end, fullback and linebacker. "At my school, I probably could've played O-line," he said. "I was one of the biggest guys and I was only around 200 pounds." MARK KAFENTZIS and his brothers -- as they do each year -- will make it to as many UH games, home and road, as possible. This year they might see another No. 8 named Kafentzis in the Hawaii secondary. "Nothing's going to be handed to me," Tyson said. "It was a decision that was kind of a mutual thing. We're so stacked at linebacker and moving from a 3-4 to a 4-3 -- that's one less linebacker. It's good to have competition at every position. We're pretty deep everywhere. Safety we're deep. Deep at linebacker, deep at D-line. We're definitely deeper than past teams of Hawaii." Dad might not agree completely. The Rainbows were loaded on both sides of the ball his senior year of 1981, when future NFL players like Dana McLemore, Niko Noga, Jesse Sapolu, Gary Allen and himself led UH to a 9-2 record. But he also knows the 2007 Warriors are poised to improve on that record, and his son will be part of it whether he's a starter or not. "Sometimes it's a matter of being in the right place at the right time," said Mark Kafentzis, who played cornerback at times during his UH career. "The more positions you know the better it is for the team. And I know he'll do anything for the team."